Feel the thrill of a colossal fish on the end of your line as your experienced guide goes to great lengths to help you land a world famous King Salmon. These fish are renowned for their size as well as their fight and will work you like no other freshwater fish. 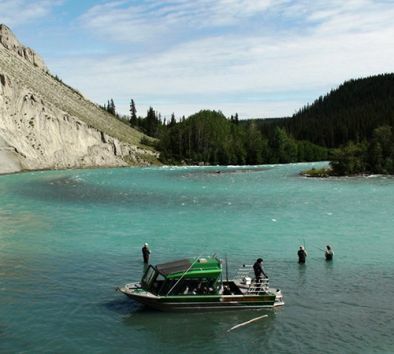 Blast up glacial rivers in a custom jet boat designed for putting you on trophy Chinook. You highly mobile jet boat is able to quickly move from one fishing hole to the next to maximize your access to fishy waters. Minimum age is 10. Fishing license and king stamp are required for anyone 16 years of age or older. License and stamp are available for purchase at the lodge upon arrival night. Dress in warm layers. Bring a raincoat, sunglasses and camera. This tour accommodates anglers of all experience levels. You will be fishing from shore and footing is uneven and can be slippery. You must be able to hike short distances over uneven terrain. Tour includes all required fishing gear, waders and personal flotation device. For an additional charge, your fish can be processed, frozen and shipped. Due to changing fishing conditions, tour departure times may be changed at tour operator’s discretion. King season generally runs July 1st to August 10th but does vary.